Last Saturday marked the first day of Christmas, meaning there is one month until the big day! It's pretty hard to believe with the 13-degree weather we've been having here in southern Ontario, but it's coming whether we're ready or not, so I'm going to do my best to get us in the spirit. It only comes but once a year, after all, or so the carol goes. I had a lot of fun writing the 12 Days of Christmas series here last year, so I'm going to give it another whirl. Get ready for 4 weeks of gift guides, crafts, recipes and a few special guests. First up, MY wish list. I was pretty lucky to receive a few of the items on my list last year, so fingers crossed it works again. 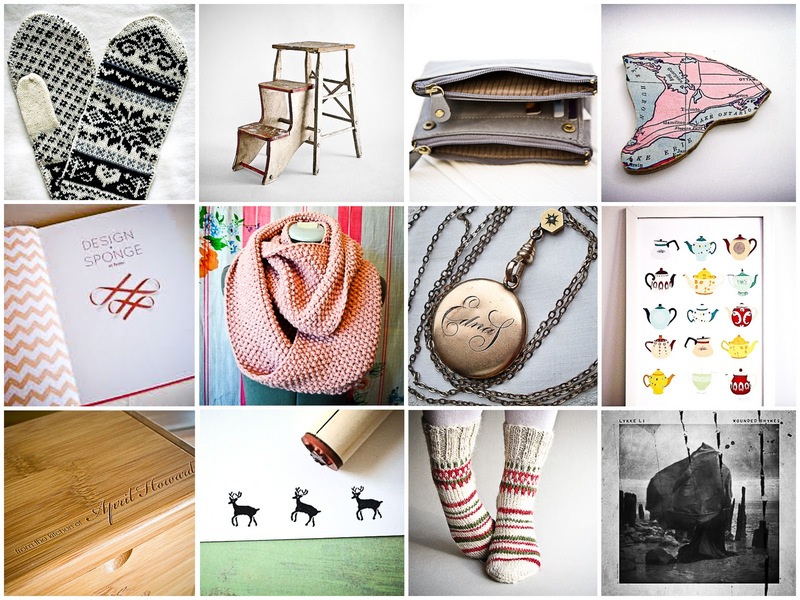 I hope you spot a few things here for the ladies on your list too! 1. Norwegian mittens by olga2201: I'm always attracted to mittens for some reason, and these would look super cute with my black puffy coat once the temps go unbearably sub-zero. I believe White Elephant carries similar styles (hint hint). 2. Vintage Step Ladder by Hindsvik: The only chair I have in my workspace is a rolly office chair, which means I threaten my life every time I use it to reach the top of my shelves. Unfortunately, this gorgeous vintage step ladder is sold out, but it's a beautiful illustration of my need for a step ladder in general, don't you agree? 3. Marlie leather wallet by leoniesaliba: It's tough to part with my current wallet, but I bought it in Korea about 6 years ago and it's splitting at the seams, so I think I shoud say my goodbyes. Plus, my purses seem to be shrinking, so I need a much more compact version. This will do quite nicely. 4. Ontario Brooch by ME2Designs: Yet another excuse to flaunt my love of my hometown. 5. 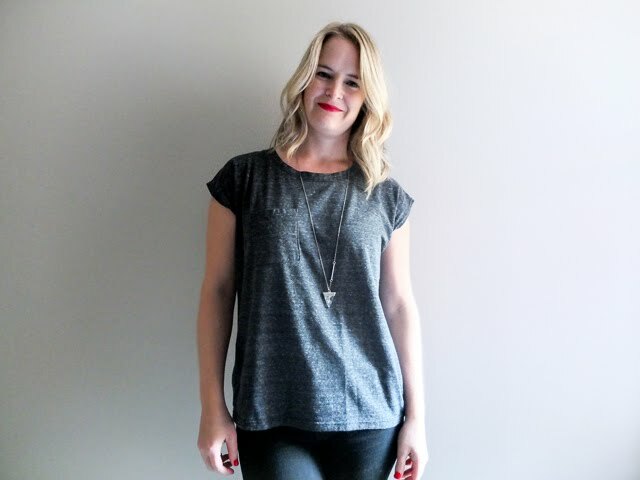 "Design Sponge at Home" by Grace Bonney: I read the Design Sponge blog every single day. Therefore, not only do I want this book, I deserve this book. 6. Light Pink Infinity Scarf by SoliSellsScarves: Again, this chunky beauty is sold old, but perhaps Soli could be persuaded to knit another for a girl it would suit perfectly? Hmm? 8. Teapots Print by lauraamiss: I have been a fan of Laura Amiss for quite some time now, and still do not own one of her pieces. This one seems made for me and any tea lover on your list. 9. Personalized Recipe Box by exquisiteinks: This recipe box is extra special with its personalized engraving and hooks on the inside of the lid to hold your recipe while you cook. 10. Deer Stamp by norajane: I need a stamp that says how much I love stamps! Haha! These deer are pretty darn cute, especially for the holidays, but I wouldn't be picky about receiving any of the tiny, detailed rubber stamps from this shop. 11. Wool socks by milleta: My feet seem to lose all blood flow in the winter, so I can always use another pair of thick woolly socks. 12. "Wounded Rhymes" by Lykke Li. Get me some. 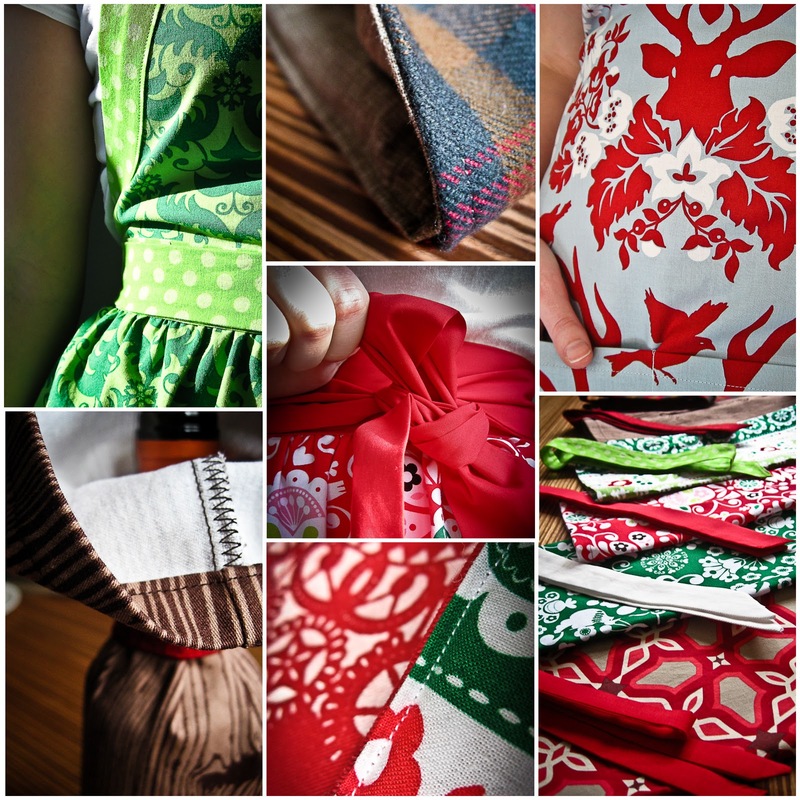 Curious about the cookies in my holiday product shots this year? 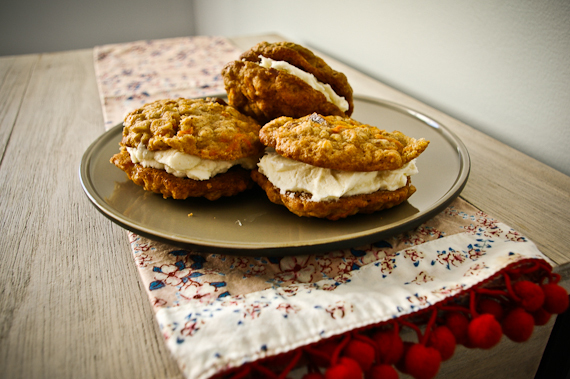 They may look like some kind of oatmeal chip cookie, but they're actually carrot cake cookies. Genius. And delicious! Stomach-ache because you've eaten six in one day delicious! They seriously taste like you're eating a mini carrot cake, especially when you do them up proper, sandwiched with cream cheese icing. Plus, with oats, carrots and raisins, you could almost pass these off for healthy. The recipe is adapted from Martha Stewart's version in Cookies. You can also find the recipe online here. We used fresh carrots we had just pulled up from our garden. A part of me thinks they were extra good on account of our carrots. We didn't have raisins, so we cut up some dates and soaked them in Maltese honey liquor. Because we're fancy like that. We didn't have ground ginger, so we put in a pinch of all spice, but I doubt that made any difference. For the icing, I used delicious cream cheese from the farmer's market (way better than Philadelphia) and also added about a quarter-cup more icing sugar to the icing, because I don't like icing that tastes too cheesy. Ok. On with the recipe, already! 1. Line two baking sheets with parchment paper and set aside. In an electric mixer beat sugars and butter until light and fluffy, 3 to 4 minutes. Add eggs and vanilla, and beat on medium speed until well combined. 2. In a large bowl, sift together flour, baking soda, baking powder, salt, cinnamon, nutmeg, and ginger; stir to combine. Gradually add flour to butter mixture; mix on a low speed until just blended. Mix in oats, carrots, and raisins. Chill dough in refrigerator until firm, at least 1 hour. 3. Preheat oven to 350 degrees. Shape tablespoons of dough into balls and place on prepared baking sheets, leaving 2 inches between cookies. 4. Bake until browned and crisped, rotating pan halfway through baking to ensure even color, 12 to 15 minutes. Transfer to a wire rack to cool. 5. Place cream cheese in a mixing bowl. Using a rubber spatula, beat cream cheese until smooth. Gradually add butter and continue beating until smooth and well blended. Sift in icing sugar and continue beating until smooth. Add vanilla and stir to combine. 6. Once cooled completely, spread about 2 teaspoons of cream-cheese filling onto a cookie. Sandwich together with a second cookie. Repeat with remaining cookies. Store in an airtight container for up to 3 days in the refrigerator. Ever wonder what this happening Hamilton is that I keep going on about? This slick video put out by the Hamilton Economic Development does a great job of conveying many of the reasons I love to live and work here. I'm so proud to call this city my home! On that note, I'm off now to enjoy it, with visits to the Farmers' Market; Mixed Media, my favourite local art store; and, later, Hamilton Place, to see Chantal Kreviazuk perform with the Hamilton Philharmonic Orchestra. If you've been following me on twitter or facebook, you'll know that I've been gradually releasing holiday items for about a week. It is all available in the shop now, so go check it out! As you can probably tell, I like things to be practical and versatile, so I made a concerted effort to make sure many of my holiday items wouldn't have to be packed up at the end of December. I'm also trying a few new things with this line, such as wine bags (oooh) and fabric choices (ahhh), so please let me know what you think. 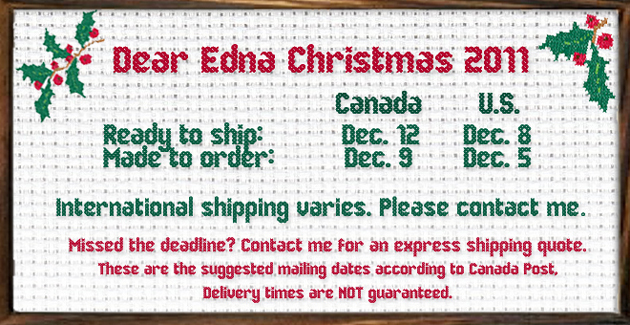 Of course I welcome orders after these deadlines, but I can't guarantee they will arrive in time to make it under the tree. Local customers are welcome to pick up their purchases right up until December 23rd. This project has been finished for weeks, but I haven't had the chance to show you! For shame. You know that can only mean one thing, though. Busy busy busy. It appears the holiday shopping season has begun, whether I'm ready for it or not. But why not take a break from the busy for a moment and adore some cute fuzzy bunnies, shall we? This was my second attempt at a crochet baby blanket and my first attempt with the technique called filet crochet. As usual, it took a few false starts (no one wants a flat-nosed bunny) and the first block was slow, as I also had to learn how to use a charted pattern, but the remaining blocks knitted up quite quickly, if you ignore my 3-month summer hiatus. 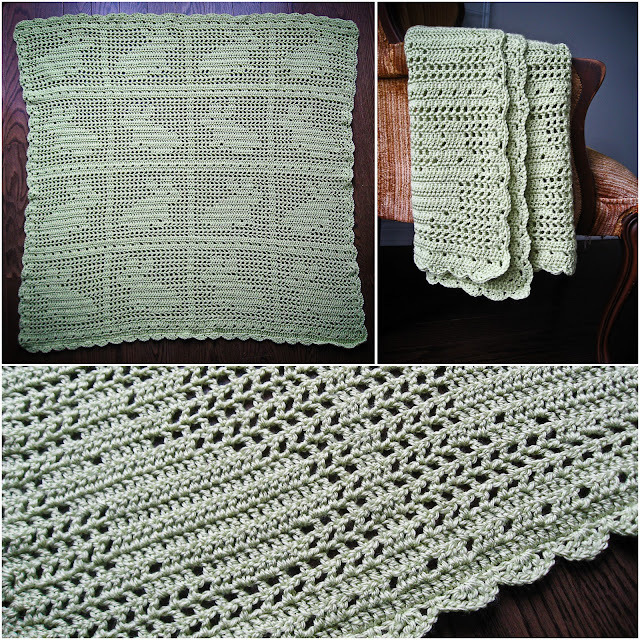 I'm not sure the photos do it justice, but one of the best features of this blankie was the fern green yarn. The colour was so pretty and gender-netural, I'd use it again in a heartbeat. I'm really happy with the finished product and I'm pretty sure the baby I gave it to was too, who thanked me in giggles and cuddles. What more could I ask for now, really? This was a free pattern, so there's no excuse not to give it a whirl. If I could do it, you can. All the details from the yarn to the crochet hook I used can be found on Ravelry, if you're interested.